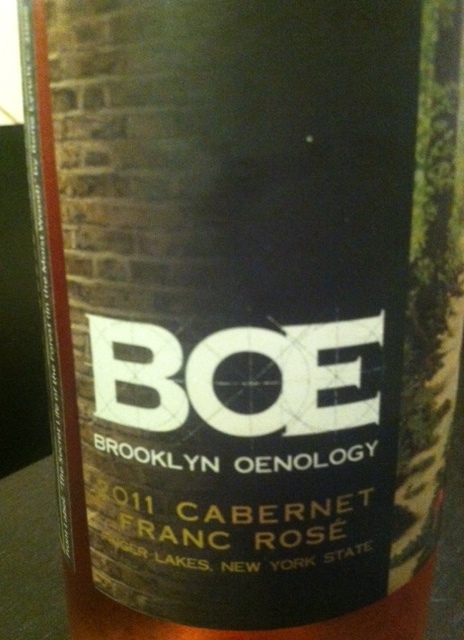 Over the weekend I was in Williamsburg, Brooklyn for another event when I walked right past the Brooklyn Oenology Winery and School. Nothing like having an unexpected tasting on your way to do something else! My friend patiently waited while I did a flight. There were two flights that they offered, and one of them had a Paumanok and a Sparkling Pointe, much to my delight. But I am going back to the North Fork this weekend for a special occasion, and rumor has it they may even still be harvesting! So I will have lots more to say next week. The flight I did had several nice wines made from grapes from either the North Fork of Long Island or the Finger Lakes up north. 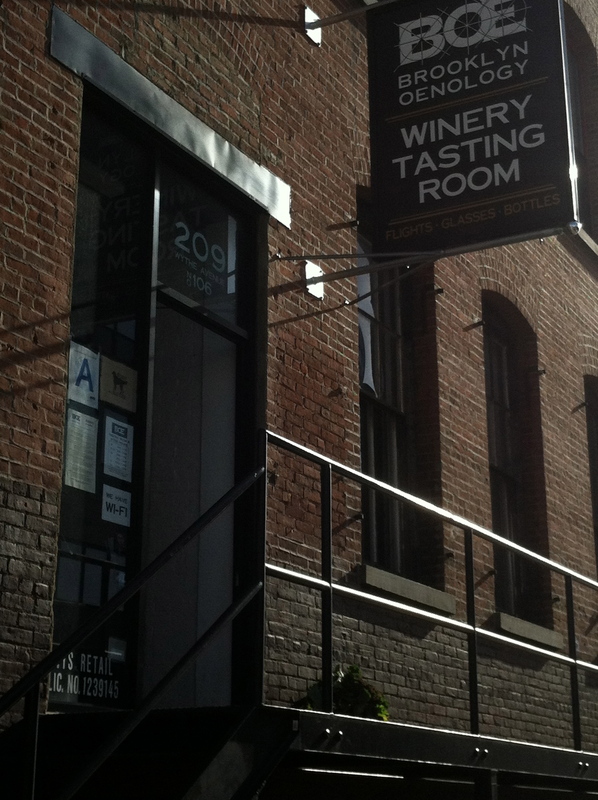 While they don’t have their own vineyards, everything is fermented and vinted in Brooklyn. The wines in the flight included a steel-fermented Chardonnay, an orange Pinot Gris, a Merlot, a “Motley Cru” (Rhône style red) and this wonderful dry Provence-style 2011 Rosé, made from Finger Lakes Cabernet Franc. This is the wine I bought and am enjoying right now. This is my favorite type of rosé and the first one I’ve had from a local winery this season. Its color is a pale orange, and on the nose were crisp citrus, watermelon, strawberry and floral notes. The palate was full of dried berries and blood orange, with medium acidity and body and refreshing minerality that made it very well-balanced and satisfying. The label features the painting ‘The Secret Life of the Forest (In The Moist Wood)’, by artist Rene Lynch. All of their labels feature the work of local artists, a trend in winemaking I love, as a former art major! I have had one other very nice Provence-style dry rosé from Brooklyn, from Red Hook Winery. I paired it with a fresh quiche and salad from a farmer’s market in another part of Brooklyn I visited the next day. I also visited a local New York (Hudson Valley) winery who was operating a stand at the market and bought two wines and a half gallon of pure juice from their grapes. I will be taking that juice and making it into my first homemade wine, and I can’t wait to share that learning experience with you. I have to order some supplies so that will be an upcoming story, if not several. I am looking forward to digging into more of what this place has to offer, from classes to a tasting event, and trying more of their wines. You can buy their wines online, in their store, or in over 150 stores all over NYC. They also sell local craft brews and ciders, and have their own wine club. What a lucky find! This entry was posted in My Wine Reviews, Wine Travels and tagged brooklyn oenology, cabernet franc, classes, motley cru, rose, winery. Bookmark the permalink.